^ 3.0 3.1 3.2 Gibor Basri, Michael E. Brown. Planetesimals to Brown Dwarfs: What is a Planet? (PDF). California Institute of Technology. [2008-08-04]. ^ Soter, Steven. What Is a Planet?. Scientific American. 2007, (1). ^ 8.0 8.1 The IAU draft definition of "planet" and "plutons" (新闻稿). International Astronomical Union. 2006-08-16 [2008-08-16]. ^ 9.0 9.1 Gareth Cook. Nine no longer: Panel declares 12 planets. Boston Globe. 2006 [2006-08-16]. ^ Mike Brown. How Many Planets Are There?. CalTech. 2006 [2006-08-16]. ^ 12.0 12.1 Draft Resolution 5 for GA-XXVI: Definition of a Planet. International Astronomical Union. 2006 [2006-08-16]. （原始内容存档于2006-08-22）. ^ Planet Definition" Questions & Answers Sheet. International Astronomical Union. 2006 [2006-08-16]. （原始内容存档于2006-08-22）. ^ Planetary Scientists Support Proposed Redefinition Of A Planet. SpaceDaily. 2006 [2006-08-19]. ^ Mike Brown. New Planets. 2006 [2006-08-22]. ^ Robert Roy Britt. Nine Planets Become 12 with Controversial New Definition. Space.com. 2006 [2006-08-19]. ^ Pearson education. The Flap over Pluto. infoplease.com. 2006 [2006-08-19]. ^ Phil Plait. Congratulations! It's a planet!. Bad Astronomy. 2006 [2006-08-18]. ^ Nick Matzke. Wherein I argue emotionally about the definition of "planet". The Panda's Thumb. 2006 [2006-08-18]. （原始内容存档于2006-09-08）. ^ Robert Roy Britt. Earth's moon could become a planet. 2006. ^ Ira Flatow and Mike Brown. Pluto's Planet Status / String Theory. Science Friday. National Public Radio. 2006-08-18 [2006-08-22]. （原始内容存档于2006-08-30）. ^ 22.0 22.1 Britt, Robert Roy. Pluto May Get Demoted After All. Space.com. 2006-08-18 [2006-08-24]. ^ Details Emerge on Plan to Demote Pluto. 2006 [2006-08-18]. ^ Günther Wuchterl. The IAU Committee Presents Today in Prague the new Proposals for the Definition of Planet. 2006-08-22 [2008-08-04]. ^ Günther Wuchterl. The IAU's Definition of Planet developes further - Draft c. 2006-08-23 [2008-08-04]. ^ Star-gazers puzzled by Pluto. Independent Online. 2006 [2006-08-18]. ^ Geologists Force Astronomers To Rethink Pluto Plan. 2006 [2006-08-18]. （原始内容存档于2007-05-17）. ^ Elise Kleeman. Planet, pluton or rock?. Pasadena Star News. 2006 [2006-08-20]. （原始内容存档于2007-09-28）. ^ Geoff Brumfiel. Plutons, planets and dwarves : Geologists and astronomers wrangle over words.. news@nature.com. 2006-08-21. ^ Phil Plait. Congratulations! It's a planet! (blog). 2006-08-15 [2008-08-04]. ^ Overbye, Dennis. Pluto Seems Poised to Lose Its Planet Status. New York Times. 2006-08-22. ^ Astronomers divided over 'planet' definition. Deutsche Presse-Agentur. 2006-08-22. （原始内容存档于2006-08-30）. ^ Tresch Fienberg, Richard. "The Day We Lost Pluto". Sky & Telescope. 2006-08-22. ^ Plutoid chosen as name for Solar System objects like Pluto (新闻稿). 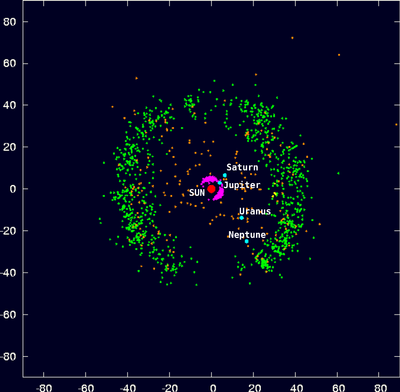 Paris: International Astronomical Union (News Release - IAU0804). 2008-06-11 [2008-06-11]. （原始内容存档于2008-06-13）.